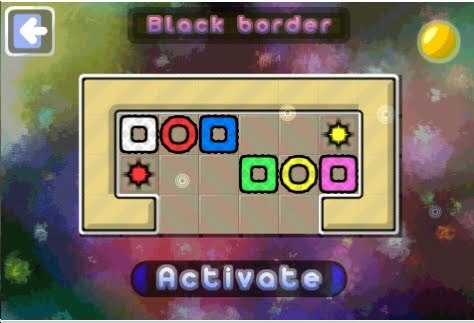 Very similar to BoxWorld and other sokoban puzzle sets. Cool penguin though! In 1995, this Mechanical Puzzle Correspondent spent $5 for Boxworld. It's sokoban. 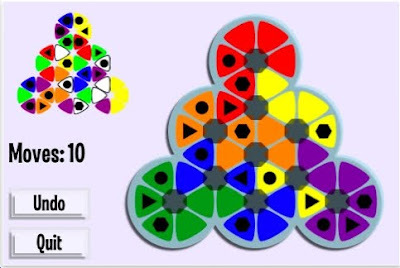 100 levels. 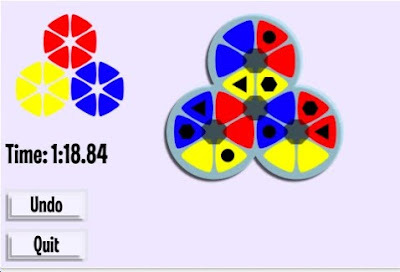 Took maybe 20 hours to solve. That comes to .25/hour. Compare that with a new film: $10 for 2 hours = $5/hour. Level 26, see image below, solved after maybe 20 attempts! 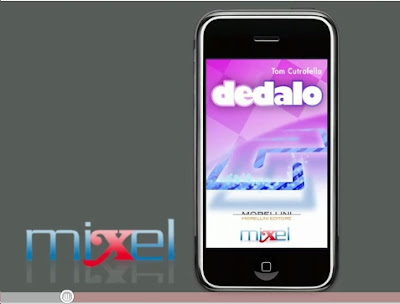 Now it's available at the itunes store for your iphone/ipod/ipad for only $1.99. Guess I overpaid 15 years ago! 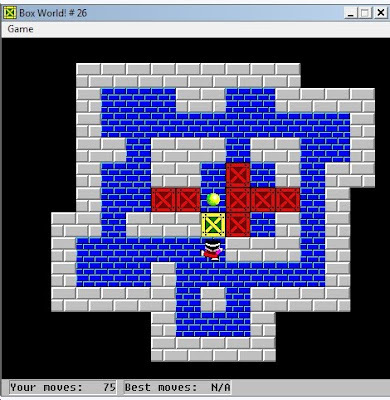 Jeng-Long Jiang produced the original Boxworld. Dat Pham Van produced the iphone version with the same exact levels. Let's hope they're friends! Note: the physical version of Mad Triad and Handy Mad Triad are a bit fragile. Don't let small children play with it because the twisting knobs will break. Arseniy Banayev created this interesting app. He calls it a 2D version of Rubik's Cube. 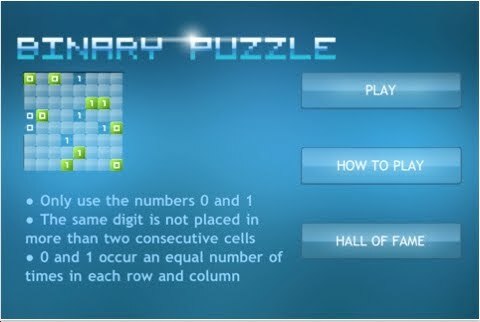 His version has over 4,500,000,000,000,000,000,000,000,000,000,000,000,000,000,000 permutations. 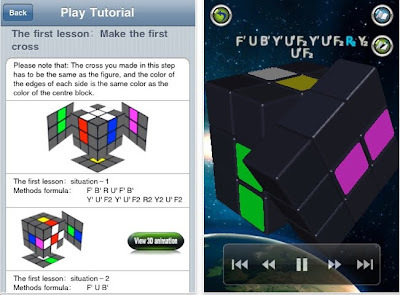 Do you aspire to learn how to solve Rubik's Cube? Li Zhijian has produced a new iphone puzzle app to teach you! Very nice job! 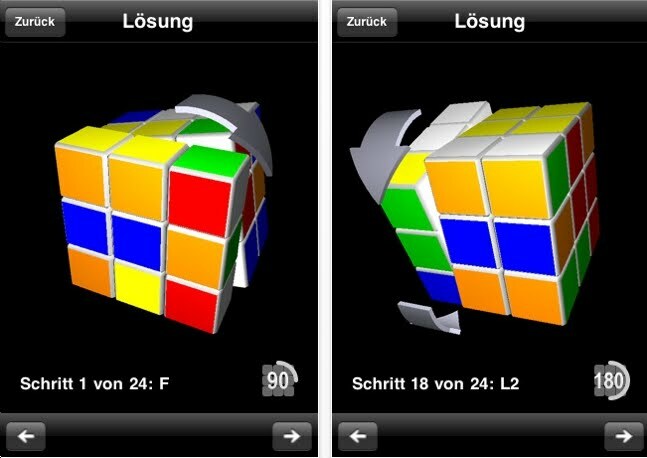 There are innumerable Rubik's Cube app games on the itunes store. Recently Ingo Eichenseher, from Germany, produced this gem. 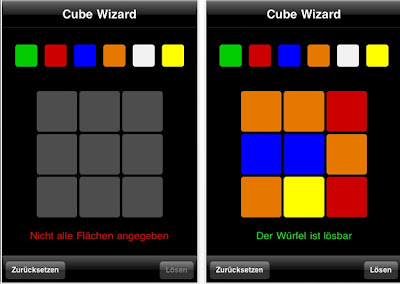 Open the application with your unscrambled cube nearby. 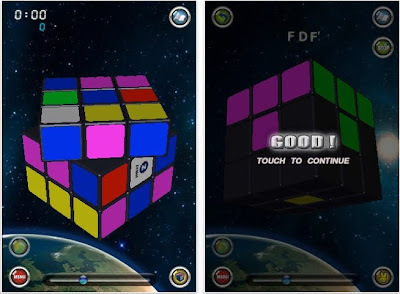 Transpose your real life physical cube's sticker colors to the virtual one. Press solve and the app will not only solve it, but it will do it super slowly so that you can restore your real-life physical cube to perfection. 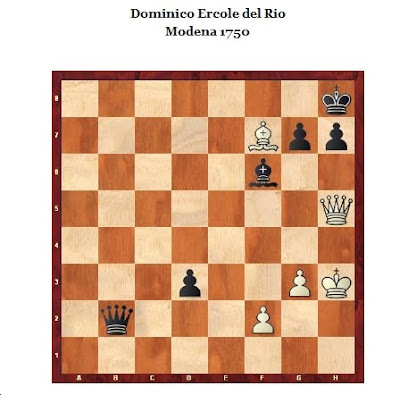 Bobby Nakanelua has created an interesting version of the 8 Queens puzzle. The original 8 Queens puzzle: place 8 queens on a chess board so that they do not attack one another. 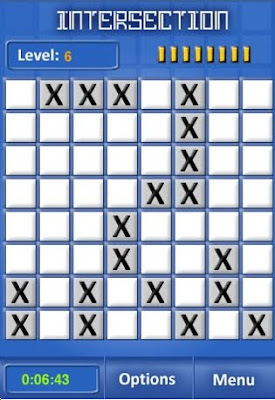 In this version, the same rules apply but if a space is marked with an X, a piece cannot be placed on that spot. Object: move the dots around and make the lines not cross any more. 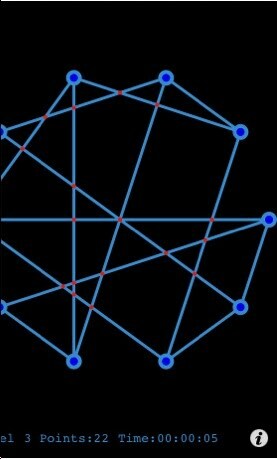 There is an online version called planarity. 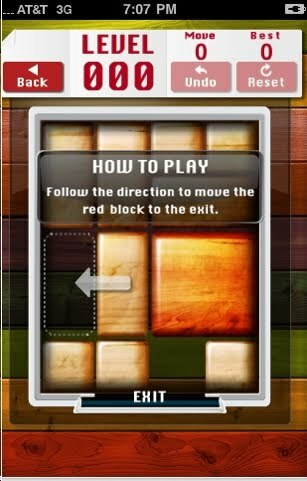 One of the most popular free puzzle apps: Flood It. It's terrific. Now comes Super Flood by Yongkai Lee. Super Flood is a nice improvement with the addition of hexagonal and triangular playing boards. 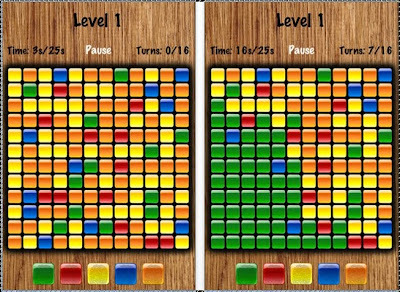 Get Me Out is similar to dozens of 'Rush Hour' apps that are available. 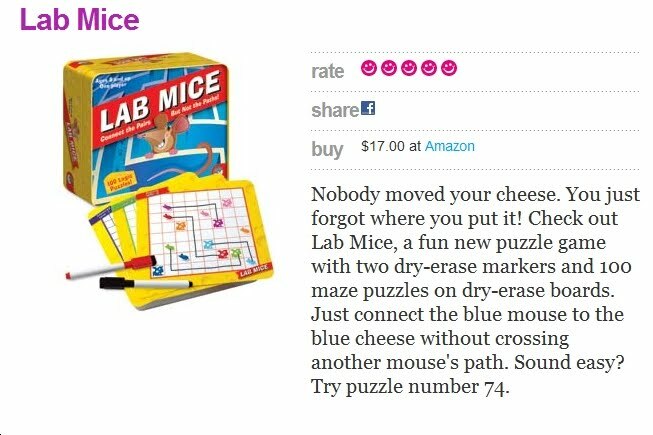 This version has a sleek interface. The 'Lite' version has 20 levels while the full version has 99 levels. See image above. 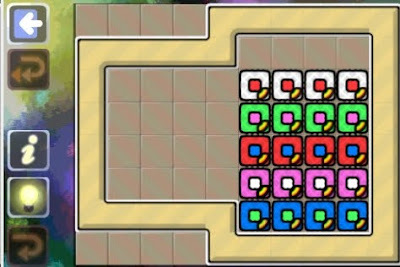 The puzzles are not new. Of course, some are very challenging. 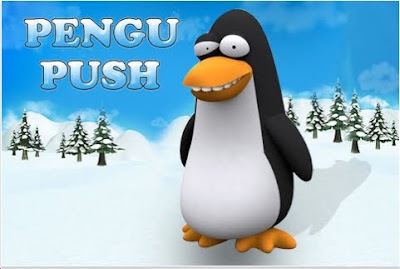 $2.99 will net you about 4 hours of entertainment. 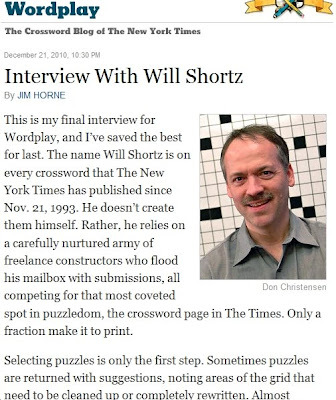 Will Shortz is interviewed, yet again, this time by his own employer. 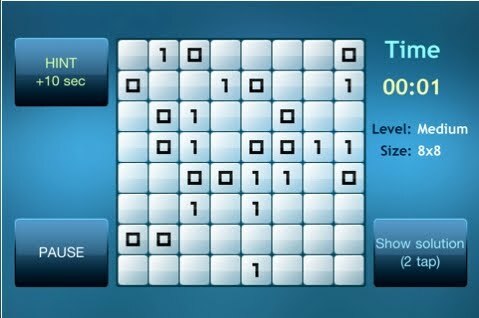 Sudoku has become a phenomenon. 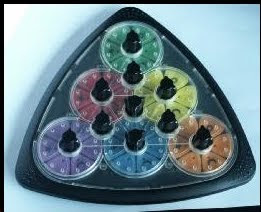 Dozens of variations have been produced. Michiel Allessie has produce an appealing new version called Binary Sudoku. 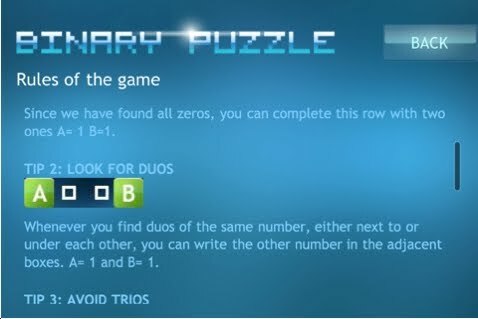 Only 0's & 1's are used. Each row & column must have an equal number of 0's & 1's. A number can never be used consecutively more than twice. So, if a row contains 0, blank, 0, then the blank must be 1. 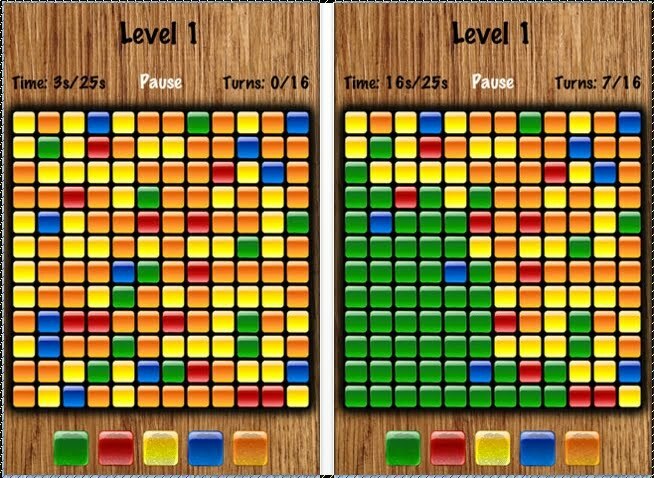 The puzzles come in 3 grid sizes: 8x8, 10x10 & 12x12. On the ipod, the 8x8 is a manageable size. 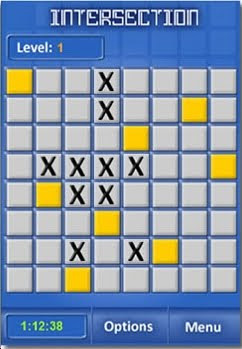 10x10 & 12 x 12 would be better for the ipad. 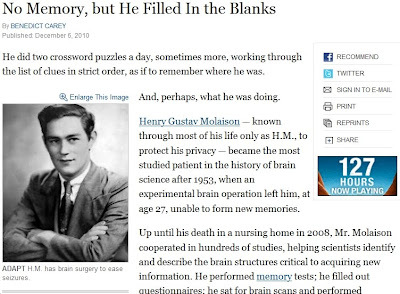 Keep your brain sharp! Spend .99 & play this game while listening to music. The February issue of Games Magazine is now on the newsstands. This Senior Mechanical Puzzle Correspondent has reported on the Mother Lode of Puzzle Designs. The Huffington Post has expanded their menu. Yes it is pro-democrat & anti-republican. 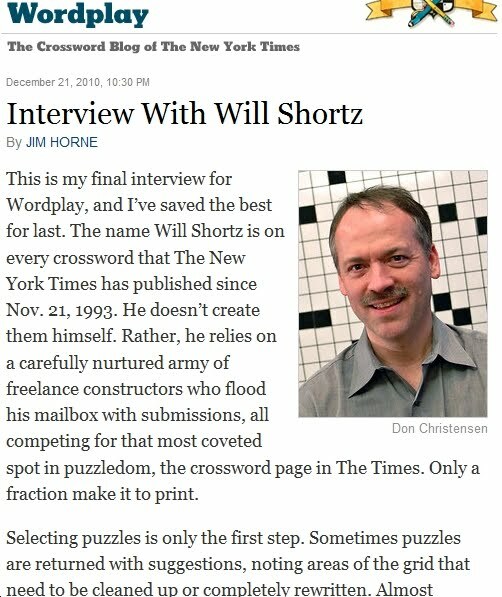 More importantly, Ariana is educating/entertaining readers with these chess puzzles. 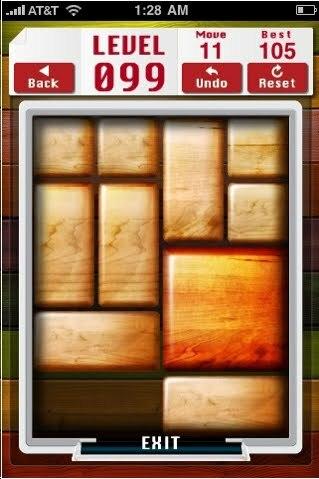 Blockoban is an outstanding puzzle app that belongs on every serious puzzler's iphone/ipod/ipad. 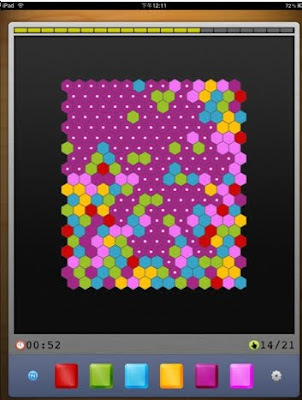 The object is to move the colored squares or open circles onto their matching targets. 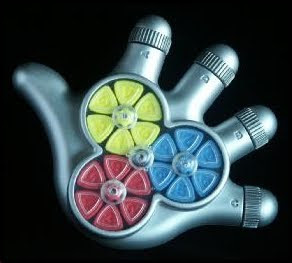 Think of it as a combination of Sokoban and Lunar Lockout. But there's so much more. 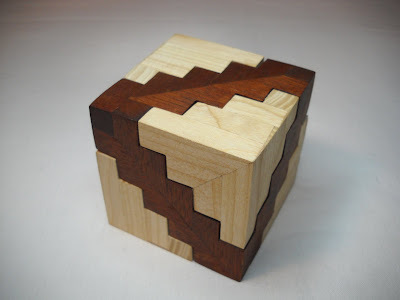 On some puzzles, squares will have a notch in the upper left hand corner. This means that they travel together. If one of them gets moved, they all move in the same direction. 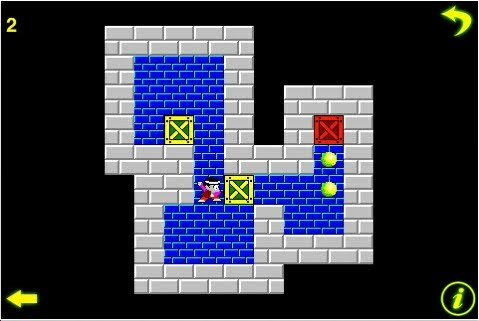 Like Lunar Lockout, moved objects will travel until they hit a wall or another object. 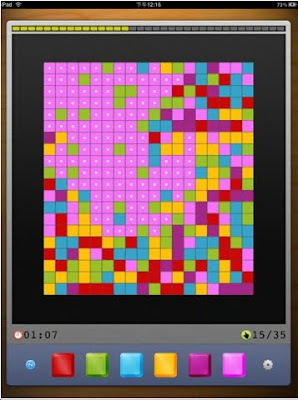 However, some puzzles have sticky squares. If a square hits another square, it will stop in that position. 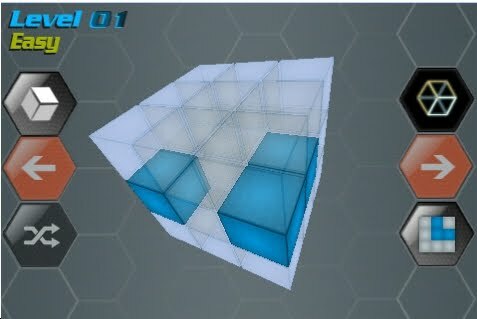 However, if a square hits a circle, the square will stop normally, but the circle will absorb the momentum and keep traveling until it hits a wall. Jean-Philipe Sarda is the brain child. 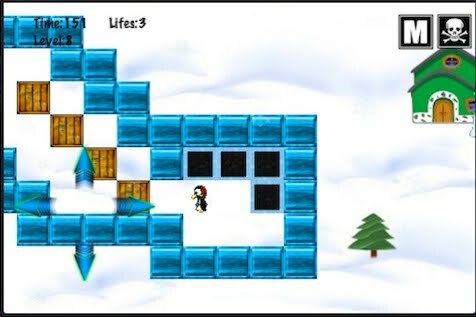 You can create your own levels and then send them in. One of the best bargains in town. Mama Mia! 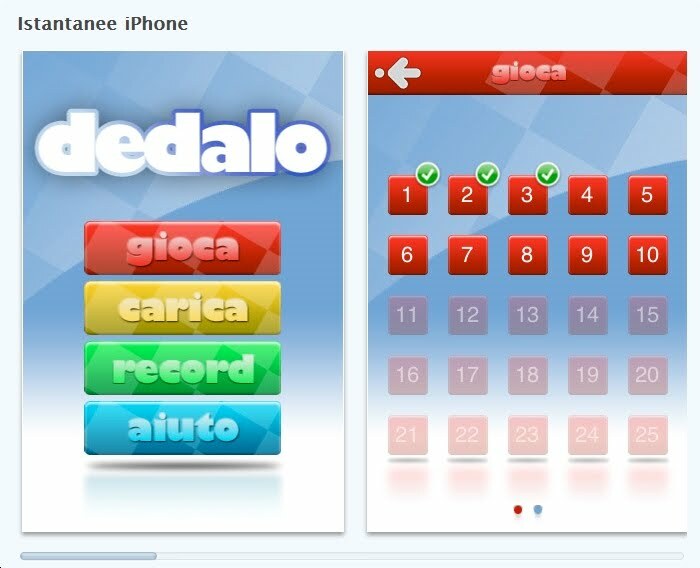 The Dedalo iphone app is red-hot in Italy right now. And the reviews are steller! Try Cube is a cross between MonoSpace (another great puzzle app) and Rubik's Cube. 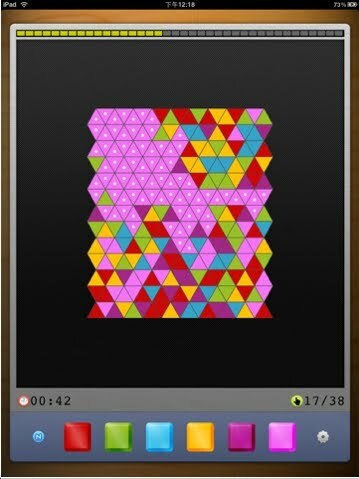 Object: turn the layers to line up the blue cubes to match the pattern on the right. 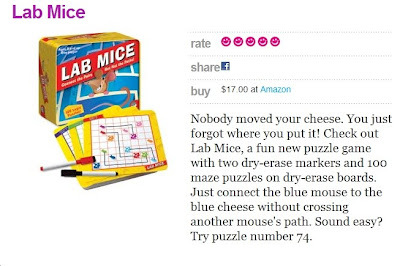 The entire section of the NY Times Science section is devoted to puzzles. This story could come from the pages of an Oliver Sachs book. Dr. Sachs is a neurobiologist and has written about his unusual patients. Do read The Man Who Mistook His Wife For A Hat! There's an incredible story about twin autistic savants with a penchant for prime numbers. Andreas Katzian has produced a nice, fun series of puzzles. 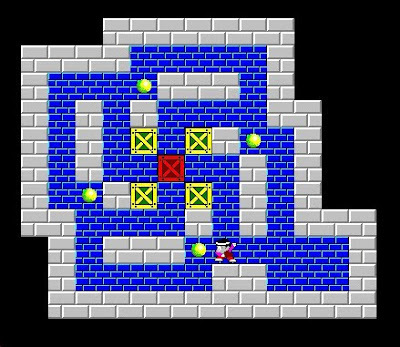 54 levels. 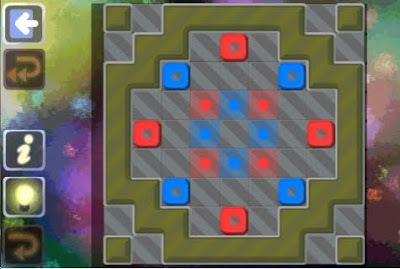 The object is to make all the stones 1 color. The bottom left corner stone represents the starting stone. If the adjacent stone is blue, tap blue and your the stone becomes blue and it absorbs the neighboring stone. Like the Borg of Star Trek. 10 seconds to learn. Stone Flood is almost identical to Flood It - another iphone app.